Most customers prefer buying clothes in physical stores rather than on the internet. The reason is simple: they can try on the item they liked and pay for it being sure the item fits. According to the 2016 research by BodyLabs published in 2016, 76% of buyers try on clothes and 91% of buyers try on shoes before purchasing. And often visitors leave the store without buying since they couldn’t try on things comfortably. Amazon solves the inability to try on the clothes when ordering online by delivering the models to customer’s address via their Prime service. Other online retailers are experimenting with augmented reality technologies. Meanwhile, in the classic brick-and-mortar retail, the fitting can be improved by adding some flexibility inherent in online shopping. 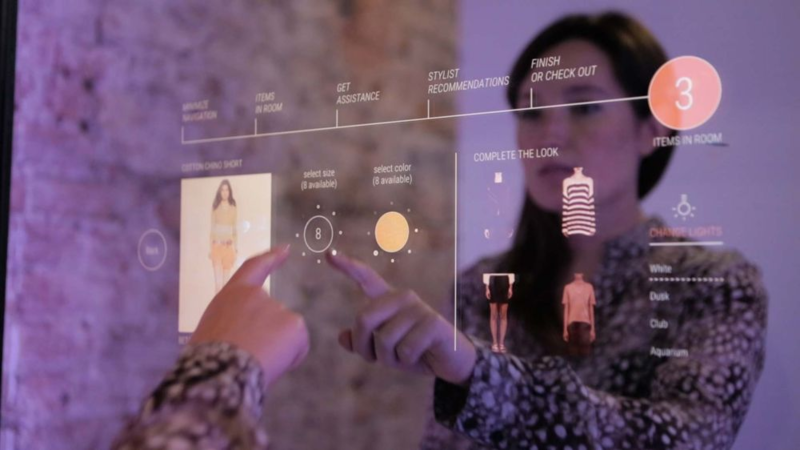 In this article, we’ll consider what an in-store interactive fitting room is, and how digital technologies in fitting rooms make customers’ and retailers’ life easier. The idea of smart fitting rooms is being popularized among retailers for a long time now. Media has been speaking about the first concepts of using interactive screens and augmented reality to simplify the fitting process since 2010. But really viable cases appeared only a few years ago. Here are the most successful ones. The Ralph Lauren Polo flagship store on the Fifth Ave in New York uses smart fitting rooms with interactive mirrors created by the company Oak Labs. It is a large mirror with a touch screen installed in a fitting room. Interacting with the mirror, customers can change the lighting around to see how their look changes depending on the environmental lights. Customers can call a store assistant with other models and sizes for fitting. During the fitting, this mirror recommends clothes and accessories to complete the image. If the buyer is not ready to make a purchase on-site, they can choose to send information about the product to their mobile phone. As Ralph Lauren representatives say, the sales have increased three times after they opened the smart fitting room, and the visitors are now spending more time in the store. Before getting Oak Labs into business, its founder, Healey Cypher worked with eBay where in 2015 he designed interactive mirrors for fitting rooms in the Rebecca Minkoff stores. Now Rebecca and Yuriy Minkoff are Oak Labs co-founders and their brand uses a new technology. The Rebecca Minkoff store visitors can adjust lighting, request store assistants to bring other goods and sizes in the dressing room, and create a personal profile where the fittings history will be stored. As in the Ralph Lauren flagship, each item in the Rebecca Minkoff store is equipped with a radio-frequency identification (RFID) chip. In the fitting room, the product is automatically recognized and its details are displayed on the mirror. Smart fitting rooms are only a part of Rebecca Minkoff’s strategy called “the connected store”. Prior to visiting the fitting room, a customer can use a large mirror display on the shopping floor to view promo materials, install a branded app on their phone, quickly find the items they need and forward them to the dressing room. 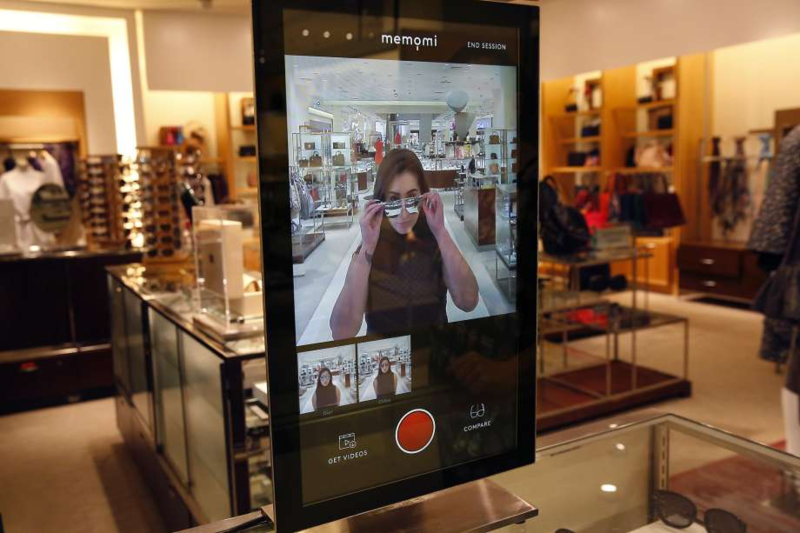 The main task of Memory Mirror in the Neiman Marcus store in San Francisco is to make fitting faster and more pleasant. Using the mirror the customers don’t have to re-try on clothes as the mirror can record short videos which allow the customers to compare several chosen images. In addition, the customers can save a photo of their image and send it to their friends on Facebook. We’ve highlighted five major advantages retailers and buyers get from smart fitting rooms. A limited amount of things to try on; inconvenience of calling an assistant while standing naked in the fitting room; the need to make extra changes in order to return to the shopping floor while hoping no one will occupy the booth — all these things frustrate and sometimes turn the wear-buying process into a real anguish. 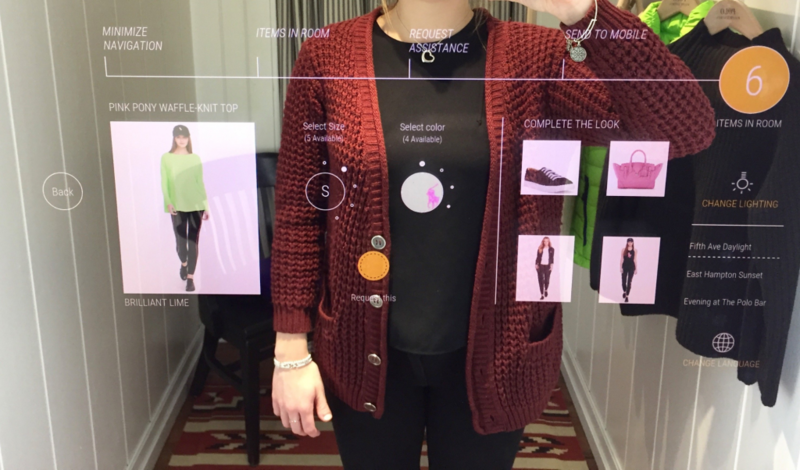 Along with making the fitting rooms more comfortable, interactive technologies help customers make more meaningful and conscious purchase decisions. For example, the ambient lighting adjustment and detailed information about the product is enough for a customer to decide independently whether they need this product, therefore this decision will not be imposed to them from the outside. Interactive fitting rooms let customers look through the available items without going back to the shopping floor. They also make it possible to call a store assistant to bring other models and sizes or a professional stylist with tips for creating a look. These features engage the customer not just for a one-time shopping, but help establish long-term relations with the brand. After getting the experience and services no other store provides, the customer will come back to get it again. The customer, demotivated by an insufficient in-store experience, usually leaves without making a purchase. The engaged customer, who feels comfortable in the store, is more likely to make a purchase. Moreover, they will build trust with the store and will be willing to come back later. Trust means they will follow the recommendations on the display and leave their personal details for participating in the loyalty program to receive personalized offers on their smartphone or during their subsequent visits to the store. This is especially relevant for a young audience. According to the investigation by CrowdTwist, a supplier of omnichannel analytics solutions, 75% of millennials and Gen Zers agree to share their personal data in exchange for personalized offers. 64% of two groups combined would prefer those brands and stores that offer loyalty programs. For a wear retailer, a fitting room is the key touchpoint of converting visitors to customers. Therefore, a fitting room is the best place to collect analytics about how a customer interacts with products. Which dress is usually bought right after fitting? Which one was tried on several dozens times a week, but wasn’t bought anyway? Information like this is extremely valuable for the retailers since it helps understand what do their customers want and offer them the range of products and the quality of services the customers expect. It’s almost impossible to get such findings without the help of interactive in-store technologies, especially if the store is a large one. A smart fitting room can tell the retailer exactly how many items the customer tried on and how many they bought. It will track a customer’s purchase history in the given store or chain and will accurately calculate the conversion. Now, as the retailers are actively building omnichannel strategies and add interactivity to their stores, the clothes-fitting experience is something that shouldn’t be left without attention. The advantages of smart fitting rooms and interactive mirrors are obvious, but the retailers are not using them very actively so far. It’s all about the seemingly high financial risks connected to such innovations. 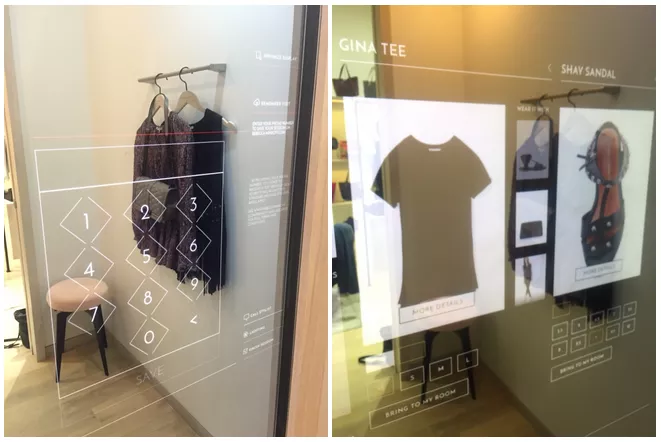 However, the concept of interactive fitting rooms shouldn’t necessarily follow the idea of smart mirrors, which are more suitable for small-size designer stores. All their functionality can be employed using affordable devices like tablets and touchscreens, and the use of the technology can be scaled depending on the size of the store and its product range.